Dolores Hart, who at age 24 startled the film world in 1962 by leaving a thriving screen career - including two roles opposite Elvis Presley - to become a nun, has returned to Hollywood for her first visit after 43 years in a monastery. Now the Rev. Mother Dolores Hart and prioress of the cloistered community at Abbey of Regina Laudis in Connecticut, she has been renewing friendships from her studio years. Why? To spread awareness about a largely mysterious neurological disorder that afflicts countless Americans, including herself, called peripheral idiopathic neuropathy. Last month, Hart testified at a congressional hearing in Washington, citing the need for research into a cause and cure for the painful and crippling disease. Over a recent lunch at the Beverly Wilshire Hotel, Mother Dolores spoke of her ordeal with the disease. She also told of her long ambition to be an actress and what ended that phase of her life. She seems in radiant health at 67, her cheeks smooth and rosy, her blue eyes clear. She wore traditional nun's attire, with a couple of additions: a green hand-knit sweater under the robe and a jaunty black beret. In 1999, Hart underwent a root canal. The dentist suggested doing another root canal at the same time, and she agreed. Two days later, Hart awakened with searing pain. "I couldn't eat," she recalled. "When I put my feet on the floor, I couldn't stand. My feet felt like they were on fire. I couldn't talk. I thought, 'This is ridiculous.' I couldn't understand what in the world was going on. A doctor said this would improve, but it kept getting worse." For six months, she journeyed from doctor to doctor, yet none could figure out what was causing her pain. Finally, a New York specialist tried changing her medicine and she gradually was able to leave her wheelchair and resume a more normal life. The luncheon conversation moved to her acting career, and she spoke fondly of that period in her life. "From the age of 7, I never in my life wanted to be anything but an actress," Hart said. She was a strong-willed girl even at that age. When her parents divorced in Los Angeles and were constantly wrangling, she wrote a letter to her grandmother in Chicago asking to live with her. She was soon on a train to the Windy City - alone - a ticket pinned to her coat. Hart's grandfather was a projectionist at a downtown movie palace and she often accompanied him to work. Her special job was to awaken him from naps every 12 minutes so he could change reels. Years later, Hart was back in Los Angeles playing the lead in a school production of "Saint Joan" and an admirer asked where she had studied acting technique. She admitted that her only schooling came from analyzing actors' performances - without sound, no less - in the projection booth of a Chicago theater. A friend notified the studios of a remarkable young actress in "Saint Joan," and Hal Wallis, an independent producer at Paramount, sent a scout to check her out. He ended up recommending Hart, and a film test and contract soon followed. 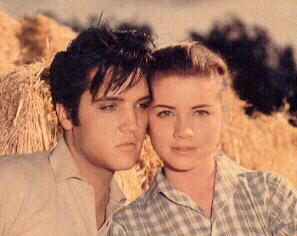 She made her screen debut as Elvis' love interest in 1957's "Loving You," his first starring role. "I had no idea who Elvis Presley was," she admitted. "When I first met him, he was just a charming and very simple young boy with longer sideburns than most. He couldn't have been more gracious. He jumped to his feet and said, 'Good afternoon, Miss Dolores.' He and Gary Cooper were the only ones in Hollywood who called me that." Hart made another film with Presley, "King Creole," and appeared in prestigious productions such as "Wild is the Wind," with Anna Magnani and Anthony Quinn, and "Lonelyhearts," with Montgomery Clift and Myrna Loy. "I was never a star," she insisted. "Being a star means your name is above the title. Mine never was." A clever talker, she was a regular on the talk-show circuit and was a fan-magazine favorite. "I really loved the acting life," she said. But when she was appearing in the Western "The Plunderers" with Jeff Chandler in 1959, she looked in the mirror and heard a voice saying: "You're really enjoying this, but you're not going to do this much longer." She was puzzled but continued working. After nine months in New York with the play "The Pleasure of His Company," she complained to a friend that she was weary. The friend recommended a retreat at a Connecticut monastery. Hart was hesitant but decided to go. She found a remarkable peace. She continued returning to the monastery twice a year. Back in Hollywood, she became engaged to Los Angeles businessman Don Robinson. One night, she related, he asked her, "Do you love me?" She answered, "Yes, I love you." He asked her again. Same answer. "It doesn't sound right," he said. The engagement was canceled, and in December 1962, she flew to Connecticut, never to return - until now. Mother Dolores is proud of one element of her Hollywood life: being invited to become a member of the Academy of Motion Picture Arts and Sciences. She is still a member and votes each year for the Academy Awards. Does that mean she sees all the nominees, no matter how bawdy? "Yes, I do," she replied with a smile. "If you're a Benedictine, as I am, you're supposed to be capable of integrating anything."